Grammy, we need you to come fix my pants! 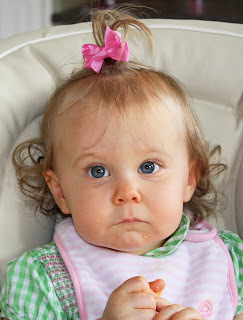 In other news, I will finally wear a bow in my hair but only if I don't notice mommy putting it there. If I do, I rip it out! 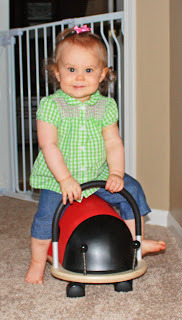 This is my wheely bug. It is now my favorite toy all of a sudden. I love to wheel it all around the living room and kitchen and now I like to ride it. Thanks Aunt Randi!!!! she is so ADORABLE!! i love her hair. Wow! She is getting so much hair and looking so much older in only the month since I last saw her! What a cutie....I want to squeeze her...especially those thighs! Oh my goodness! She's busting out of her pants!! I love her chubby rolls! And that 2nd picture of her just melts my heart! She is seriously the cutest little girl ever. :-) I just want to snuggle her and see her smile in person! I'll be right there to fix those pants!! So funny about the pants! She's so cute! I love this post... so stinkin' cute!!! It is so neat to see where everyone lives. Do you know where ya'll are moving to yet?